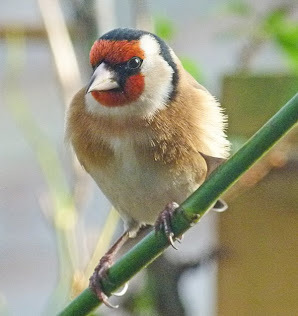 Last week the weather was kind again and the sun shone. The temperatures are unseasonally high too. 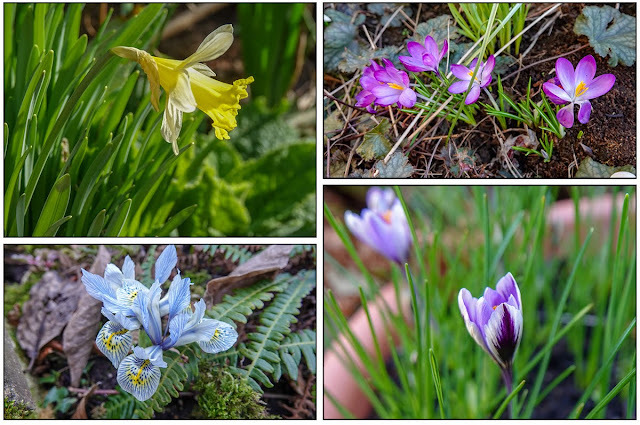 We took full advantage by having a day out a RHS Harlow Carr - I posted photos on last Wednesday's blog - and spending three afternoons on the allotment. 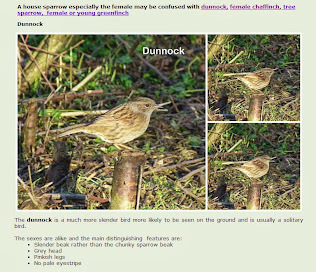 It isn't only us that have been spurred into action by the springlike weather. Martyn checked the seed potatoes that were stored in sacks in the garage and found that they had started to shoot so there was no option other than to set them out in the greenhouse to chit. Left in the dark they would produce long straggly, pale shoots which we don't want. As we may still have some frosty nights, (or even days), they have been covered with layers of fleece. Martyn posted a video here. In our garden greenhouse, our peach tree is totally out of sync. It is usually the last of our greenhouse fruit trees to flower. The apricot is first, then the nectarine and finally the peach. This week we noticed the first flowers on the peach which, means I need to get out my pollinating brush. One of our camellias is also early to the spring party. 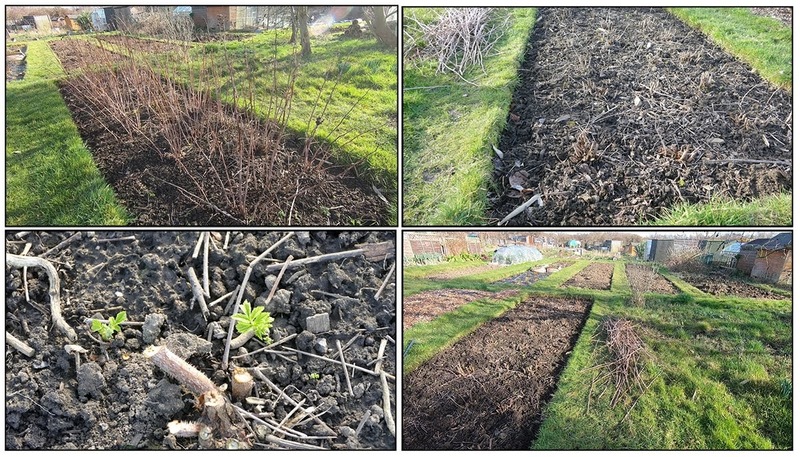 The plants on the allotment are making progress too, with many of our fruits bushes and canes sported buds. We can't really believe how much we have managed to do so early in the year and fully expect the weather to throw us a curved ball and put an end to our plot progress. One of my main jobs this week was to cut back our autumn fruiting raspberries. Last year's canes have been cut down to the ground. The new shoots are already making an appearance and they will produce this year's fruiting canes. Once the old canes were removed, I tidied the bed by removing the few weeds that had appeared and fertiliser was scattered around the plants. I posted a video about the types of raspberries that we grow on the allotment on our vlog. I also tidied up the long border of chives which are also shooting well. I bet the bees can't wait for the flowers - they love them. 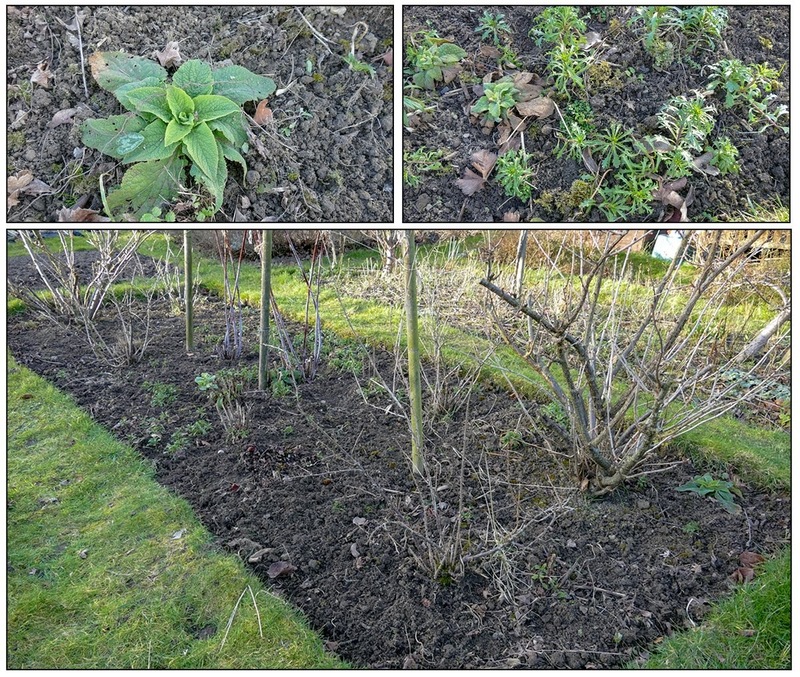 I spent a whole afternoon tidying the pear tree bed. This bed has lots of self sown flower seedlings so it was a slow job carefully weeding out the weed seedlings. Some of the flower seedlings were tiny and so it was a case of getting down and hand - or rather finger - weeding carefully. There are some large clumps of tulips which have bulked up over the years. These will be the first to put on a lovely show. There were lots of cyclamen hederifolia which self seed profusely all over the plot. Other seedling include aquilegia, candytuft and snapdragons. Still on the subject of flowers, last week I pruned back a vigorous and deadly climbing rose that grows up the back of our compost bins. Unfortunately the vicious thorns prevent me from tidying around the base of the plant so it always looks messy but when the rose is flowering it looks lovely and is perfumed too so I'll tolerate the thorns. Several weed seedlings, mainly goosegrass, (or cleavers, or one of the many of the other names that it seems to go by), were popping up in one of the rhubarb beds and so I cleared away as much as I could. I hate goosegrass. Once it starts to grow, it's size and spread increases at an alarming rate. When weeding it out the sticky barbs on the leaves and stems cling to everything and I also end up covered in the little round seeds so to attack it early is always best. As well as tidying we also fitted in some bed preparation. One of the beds that will host brassicas was limed and last years tomato grow-bags were emptied onto the bed that will become our new strawberry patch. We are only officially allowed to start fires from one hour before dusk, and so on Thursday we stayed on the plot later than usual so Martyn could burn a large pile of material that we didn't want to compost. This included a very large pile of bindweed and couch grass roots that had been drying out for a few weeks. The debris quickly burned, leaving very little to show for what really was a huge pile. Martyn also managed to tidy the plot greenhouse and wash the glass. He also made a start in tidying the garden greenhouse. He even managed to give the lawn it's first cut which is early for us. Due to visiting the allotment more regularly, we didn't harvest a great deal, just what we needed for a few days. What we did harvest was more or less a repeat of last week. We had a two and a three legged parsnip. Although they look strange they provided us with enough for a meal or two. Of the four parsnips in the photo above, one had grown very chunky. The parsnips are not small, it's the carrots that are oversized. If you are interested we have posted a few videos taken of last week's plot activity on our vlog here. Our complete monthly harvests are listed here. Last week the sun shone so we made the most of it by spending more time on the allotment and in the garden. Not only did the sunshine spur us into action, but it also sent a signal to the bulbs to get on with flowering. 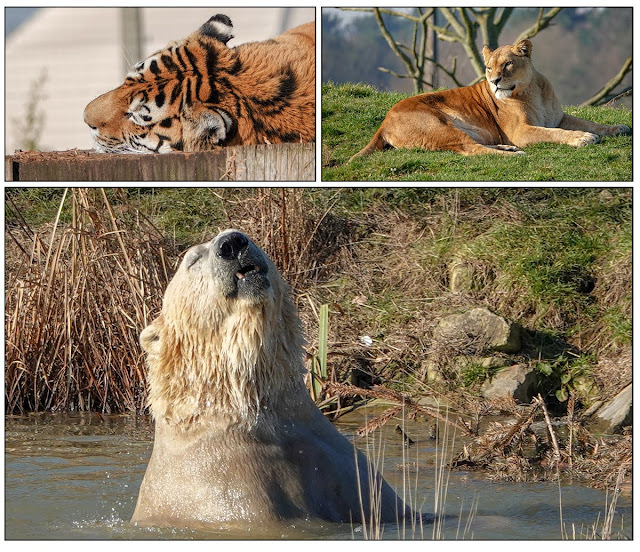 We didn't spend all our time last week gardening though, we also had a day out at Yorkshire Wildlife Park where it seemed that the animals were enjoying the sunshine too. Back to the gardening, where we were mostly in destructive mode. We have two hazel bushes on the allotment, and every couple of years one of the bushes is coppiced. This year it was the turn of the bush on the left. Martyn used a small chain saw to cut the thicker branches and the loppers to cut out the smaller ones. Having the right tools for the job makes the task far easier. In earlier times, all the power had to be supplied by human muscle and a pruning saw meaning the job took far longer. The 'prunings' created a very large pile of what will become poles and twiggy supports for lots of our plants. The twiggy pieces are also good for laying on newly sown seeds to try and prevent animals from walking on the beds or birds using the area for dust bathing. The chain saw massacre didn't stop there, as next for the chop was a row of buddleia. Each year the bushes are cut down close to the ground and each year they quickly spring up to their original height. The flowers are much loved by bees, butterflies and other friendly minibeasts. I have noticed though, for the past couple of years we have had far fewer butterfly visitors, other than the ubiquitous whites. 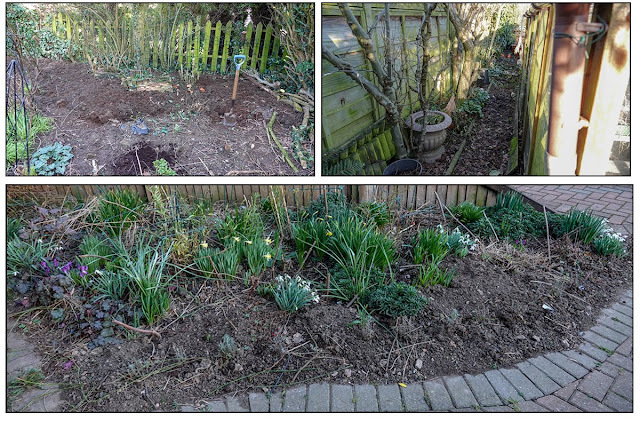 As it was fairly warm working in the sun, I took the opportunity to tidy up a few of our fruit beds. We don't use weed control fabric on all our fruit beds. Partly due to the fact that the bushes and trees were planted before we started to use the fabric but it also allows the opportunity to grow annuals in the same bed. I imply we grow these plants when in actual fact they self seed and grow themselves. We also tidied up what we refer to as the allotment perennial bed. It's a misnomer really as the bed also houses shrub roses, a couple of black elders and, over summer, some annuals too. The roses and elders have been cut back and the debris from dead plants removed. I did intend to weed the bed too but didn't get round to that. It doesn't actually have many weeds yet. The soil is quite damp in this bed due to shade cast by a huge leylandii hedge planted in a neighboring garden. All the beds that had lumpy soil have had the lumps knocked back but we have cleared another overgrown bed that has needed to be tackled for quite a while. 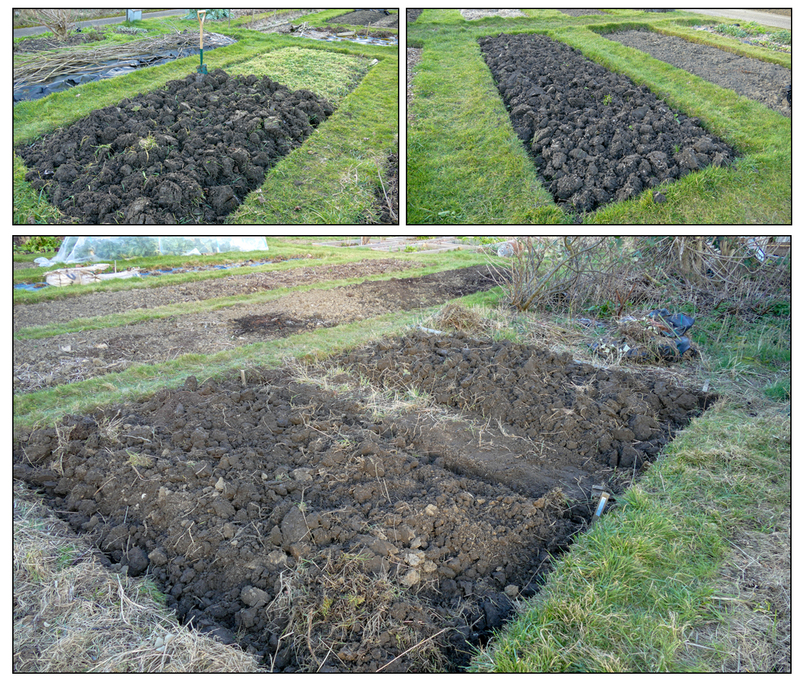 Also, Martyn has dug in the green manure, so we are not completely free of lumpy beds. 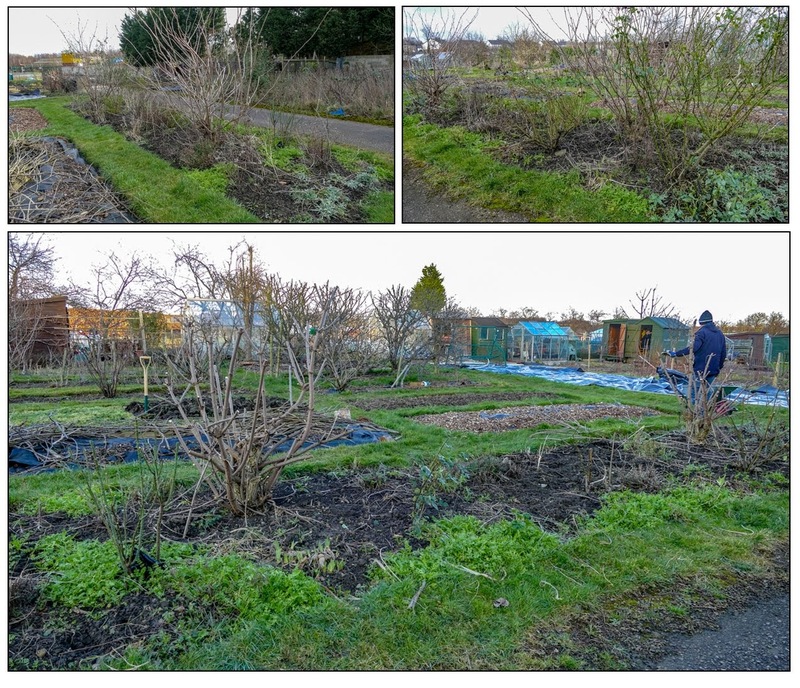 As well as working on the allotment we managed some work in the garden. Martyn cleared more of the area under the crab apple tree where the bluebells and snowdrops will be planted and also started tidying behind the garden greenhouse. Whilst he was busy at the back of the house, I tidied the bed in front of the house. We had plenty of vegetables stored at home but we did also manage to squeeze in a mini harvest. Last week, we managed a day of gardening on Monday and an afternoon at the plot on Sunday. Monday morning started at home in the garden greenhouse. I decided to plant the soft neck garlic - Solent Whyte - in a large pot. The pot had previously housed some bush tomatoes and so was still filled with compost. I removed about a third of the depth of old compost and replenished with fresh. The garlic roots will have plenty of depth in the new compost and it would have been a waste to refill the pot completely. Once planted the pot was placed outside where it could experience the frosts that are no doubt still to come. Garlic needs to be subjected to a cold spell in order for cloves to form, otherwise each clove planted will just form a solid bulb. To be honest we'd given up growing garlic as we seemed to have little success but this year I've decided to try again. We also have some hard neck garlic - White Casablanca - which was planted on the allotment in September. We have started a small garden project. As happens parts of our garden are in need of a bit of renovation. We've started to clear one area under one of our crab apple trees. 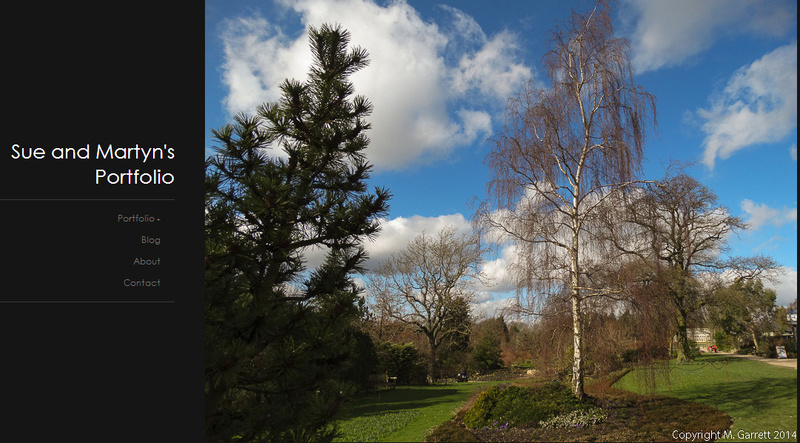 Although at this time of year the area looks fairly open, once the tree starts to leaf up the ground around the tree will be shaded, so we decided woodland type planting would be appropriate. We'd decided to plant snowdrops, English bluebells and native primroses as a starting point. Snowdrops were making an appearance in local garden centres but, at over £4 for a pot of about four bulbs of common snowdrops, it was going to be quite an expensive way of making a splash. I decided instead to order some snowdrops and bluebells in the green from an online supplier. As these arrived before the garden area was ready for planting, we decided to divide the plants into small groups and pot them up to be planted out later. Once planted the pots were placed on the patio, where we can keep an eye on them and a few days on they look to be doing just fine. I posted a video here. The primroses will be gathered from the allotment once they are growing well. They self seed readily there. The above kept us busy Monday morning and in the afternoon we headed for the plot. We needed to harvest more vegetables, as stocks at home were getting low. As it was a reasonably pleasant day, we managed a couple of jobs there too. One of the beds of green manure had been more or less killed by frost and so, Martyn dug that in. Another bed that we had cleared earlier was beginning to sprout couch grass and the area was in danger of being reclaimed by the weeds. When the bed was initially turned over the ground was fairly hard and it was impossible to remove grass roots from the solid lumps of earth. The weather, since then, had done its job and softened the soil and so we set to and removed as many of the couch grass roots as we could. The pile on the bed, on the right of the above photo, is made up of the roots that we have removed from this and another recently cleared bed. The plan is to burn these when we can. With this in mind on Sunday we moved the pile off the bed and into a position where the roots can't suddenly gain a foothold and regrow and if the weather co-operates they may dry off enough to burn. 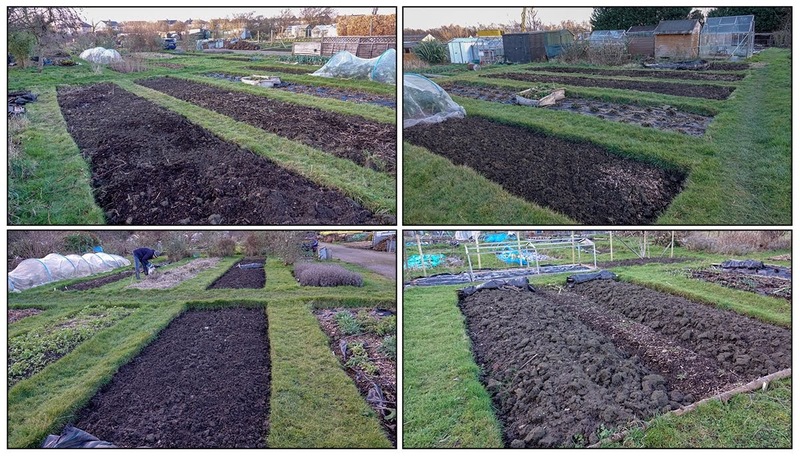 On Sunday whilst, Martyn moved the pile of weed roots, I decided to knock down the clods of soil on some of the 'lumpy' beds Usually at this time of year the soil would be too wet and claggy to make this possible, so I wanted to take advantage of the drier than usual conditions. A few days of constant rain would soon turn the soil into unworkable mud. There are still some beds where the soil is still lumpy as shown in the photo on the bottom right above. Hopefully I can tackle these on our next plot visit. Of course the aim was to gather a few vegetables to see us through the week, so each day before we came home we harvested some supplies. Amongst our regular 'pickings' was our first red cabbage. Although the cabbage doesn't look very big it was solid and we cooked five double helpings of braised red cabbage. As the recipe freezes well, four batches have been frozen and we enjoyed the other lot freshly cooked. The recipe used is basically this one but I added some raisins and cinnamon to the mix. Before you wonder how we managed to use up all the carrots and leeks harvested on Monday, we did share some with my sister.